One of Catalonia's most intriguing landmarks, the bizarre Church of the Holy Family, designed by modernist architect Antoni Gaudi, was started in 1882, but remains unfinished and an object of controversy. Gaudi worked on what was considered his masterpiece until his death in 1926, imbuing the structure with his characteristic Art Nouveau style and creating a unique new interpretation of the Gothic architectural tradition. Work has continued sporadically since, but although Gaudi had models and plans for the completed church these were mostly destroyed during the Spanish Civil War, and plans for completion have been disputed since. The extraordinary building is a UNESCO World Heritage Site despite being incomplete, and is fascinating even to those who don't find it beautiful. The church has been consecrated and is used for religious services. When it is complete it will have 18 towers and is expected to be the tallest church in the world. The anticipated date of completion is 2026 - the centenary of Gaudi's death - but this may prove ambitious. The two completed facades of the church, the Nativity Facade and the Passion Facade, are very different but both incredible, and the roof of the nave is one of the most stunning features. Visiting the church is an absolute must for travellers in Barcelona. Opening times: Daily from 9am to 6pm. Opening times may change to accommodate events. Admission: Basilica: €14,80. Basilica and Towers: €19,30. Gaudi House Museum: €6,80. 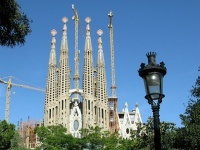 Basilica and Gaudi House: €18,30. Concessions available.